Edit#2: I’ve been told that this should be remedied in a future Exchange 2016 CU by having the error dialog include the -AuditLog parameter. 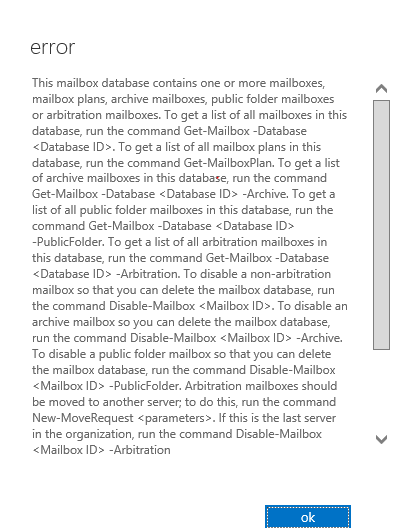 This should return the Arbitration mailboxes installed on the first Mailbox Database in the Exchange environment. When performing a migration from a previous version of Exchange, these mailboxes should be moved to the newest version of Exchange. 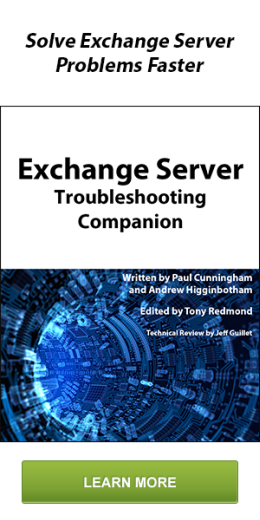 This should display a system mailbox new to Exchange 2016. Once this mailbox is moved, you should be able to successfully delete the Mailbox Database. This –AuditLog parameter seems effectively undocumented, as the TechNet Article for the Get-Mailbox command states it is reserved for internal Microsoft use. Unfortunately, we found that is not entirely the case. Thanks for sharing. Helped already. I have successfully deleted the entire Exchange mailbox, but this error continues to persist when I try to UNINSTALL Exchange 2016. Any ideas? This is driving me completely nuts! I have got an exchange 2016 DB that has no -monitor, -auditlog, -publicfolder, -arbitration, -archive yet I still get this error. Can anybody help? hi, is their any issue with moving all he monitoring\arbitration\audit mailboxes to one database? what if we have 10 servers in the dag and some of the servers only have passive copies (DR) where do we move those monitoring mailboxes in preparation to delete the default? The location of those mailboxes have no bearing on functionality. As long as they’re on 2016 you’re fine.